“In villages communal harmony is a way of life. We live with love and amity,” say locals. 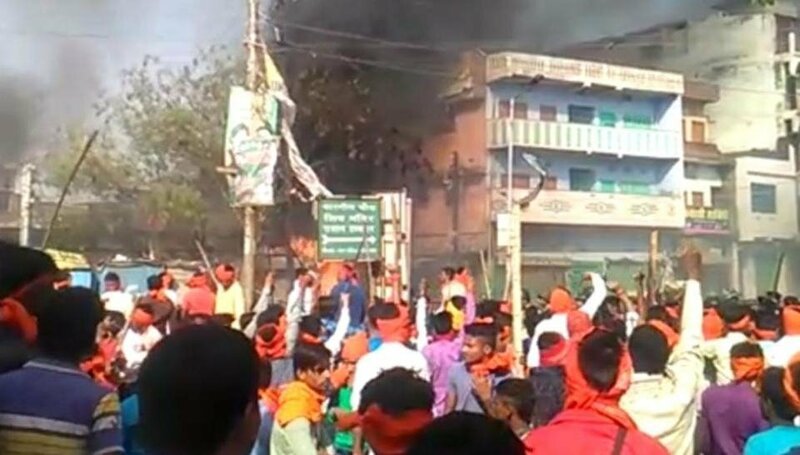 Rosara village of Samastipur was seething with tension after communal violence first broke out at Bhagalpur and in a fortnight, rapidly spread across 8 other districts of Bihar. On 27th March, an unruly mob of more than 3,000 people from neighbouring villages attacked the Ziya ul uloom Madarsa, where 80-90 children were studying along with 6 staff members. The mob barged into the madarsa and vandalised everything that was in front of them including study tables and chairs. "As we saw the mob coming to our madarsa from a distance. I along with other staff members, rapidly pushed children upstairs," said Maulana Nazir Ahmed Nazvi while adding that the mob would have killed them if their next door neighbour was not there. Doctor Ashok Kumar Mishra house adjoins the madarsa. As children and staff members rushed upstairs, Ashok, took the initiative to save them. He helped the children to climb over the common wall and take refuge at his place. He accommodated 40 children and other staff members until the mob left the place. "We are grateful to Doctor Ashok who helped us - else we would have died," said Maulana. Newsclick met Maulana in the same madarsa which was vandalised and what the communal harmony in the region was immediately visible - Maulana was sitting with another neighbor Ram Krishan Mandal and Manish Kumar Sahni ( a social activist). They had been discussing politics while sipping tea. "This incident was unprecedented," said 28-year-old Manish, who runs a stationery shop and is a social activist. "In 28 years of my life, I have never seen this. We have always lived with love and unity. Every year, there is a Ram Navmi procession but nothing like this has happened before," he added. Rosara is a Hindu majority locality with 4 Muslim houses and a madarsa. "You don't know how much we love our Hindu neighbours. During Ramzan, when we are not here, they take care of our madarsa," said Maulana. According to the people in the locality, the mob had a sizeable number of youngsters between 18-20 years of age and nobody was from their village. "There was no one from our village. They all were outsiders who were brain-washed," said Ram Krishan Mandal, who was sitting next to Maulana. A day before the violence, on 26th March, a rumour had spread across the village about few Muslim boys, who had hurled a shoe on the idol of Durga. Few Hindu families had filed a complaint in the local police station and a young teenager Sajad was arrested in that context. "They just arrested Sajad without even enquiring anything. Sajad belongs to a poor family and was helping the family with the business," said Ali Hassan, who had come out after offering a prayer at Jama mosque. "Nothing has changed amongst us even after this incident. We understand politics but our love and unity is far stronger than that," said everyone unequivocally in the madarsa. The spate of communal violence in Bihar and the silence of Chief Minister Nitish Kumar has created discontent amongst the people on the ground and also among the leaders from the ruling JD(U). The allegations that BJP (the coalition partner of JD(U) in Bihar) is trying to amplify the communal tensions has been proved true after the arrest of BJP leader Arijit Shaswat, son of Union Minister Ashwini Choubey from Bhagalpur. People see this as a failure on the part of Nitish Kumar, who had gone public about his commitment to fight communalism and corruption in the state. However, after the immense pressure by the media and the opposition, Bihar government has released Rs 36 lakhs for those who were affected because of the communal violence. This step from the government comes 15 days after the violence.